In fall 2016, Vision To Learn launched in Detroit. Partnering with the Detroit Health Department (DHD), Vision To Learn established a full-time mobile vision clinic to serve students in Detroit Public Schools Community District, and in multiple Detroit charter schools. An estimated 8,000 students in Detroit need glasses. The Detroit project kicked off with a press event at Samuel Gompers Elementary and Middle School, attended by Detroit Mayor Mike Duggan and school and community leaders. Since the launch, Vision To Learn has visited almost 100 schools and community organizations and has provided free eye exams and glass to over 5,000 Detroit students! Lead project supporters include the Detroit Pistons Foundation, The Ballmer Group, The Eli and Edythe Broad Foundation, the DMC Foundation, the Dresner Foundation, and the Jamie and Denise Jacob Family Foundation. Mayor Mike Duggan wrote an Op-ed highlighting the program and the need for student vision care, can be read here. In fall 2017, with the support of the Margaret Dunning Foundation, Vision To Learn partnered with the South Redford School District to begin a program to provide vision screenings, exams and free eyeglasses for 1,000 Redford area students. Tom Gores, owner of the Detroit Pistons and founder of the FlintNOW Foundation, is partnering with Vision To Learn on a new initiative to provide free vision screenings, eye exams and glasses to every student in need throughout Flint Community Schools. In January 2019, Vision To Learn expanded services to Grand Rapids. 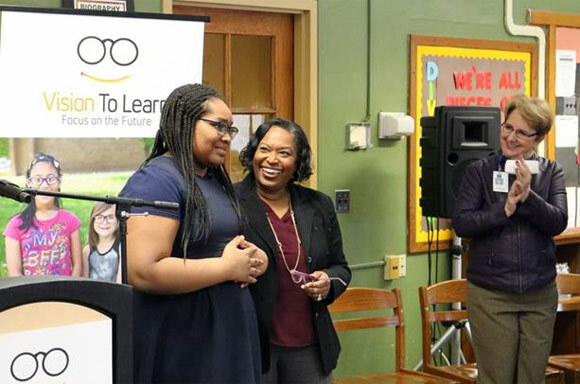 With the help of the community of Grand Rapids, Grand Rapids Public Schools, and the Kent County Health Department, students at Aberdeen K-8 were the very first to receive new glasses as part of this Michigan expansion. An estimated 3,000 children in Grand Rapids are in need of glasses. Vision To Learn continues to be grateful for the support of the Detroit Pistons and the FlintNOW Foundation. Detroit Mayor Mike Duggan helps a boy with his new glasses at Vision To Learn’s Detroit Launch at Samuel Gompers Elementary-Middle School, October 2016. NBA legend Earl Cureton and Dr. Joneigh S. Khaldun, Executive Director of the Detroit Health Department, help kids receive their new glasses at Ronald Brown Academy in Detroit, February 2017.